It's wedding season and if you or you know someone who's getting married, who's in the wedding party or who is even going to a wedding (and want to look their very best! 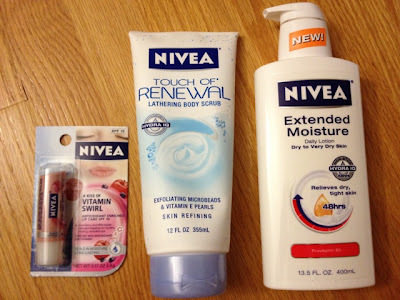 ), NIVEA has some great products to get your/their body exfoliated & moisturized. 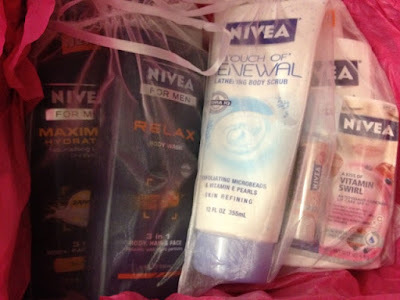 NIVEA has a slogan: Touch or Be Touched so naturally they carry skin care products designed for both women and men. They tout a "Bridal Kit" in which they recommend these products to use for the Big Day!! Touch of Reveal Lathering Body Scrub- this incredibly moisturizing body wash has exfoliating microbeads to gently slough away dead skin cells while leaving your skin silky smooth. It comes in a huge tube which makes it easy to hold onto in the shower and squeeze a good amount on your favorite pouf. This works up a great lather so you get the benefits of a body wash + scrub + moisturizer. Extended Moisture Daily Lotion- Made for those with really dry skin, this is perfect to use after the shower to help hydrate your skin. It contains Provitamin B5 as well as their Hydra IQ Technology to give your skin long-lasting moisture. I used this and my legs and feet still feel good. 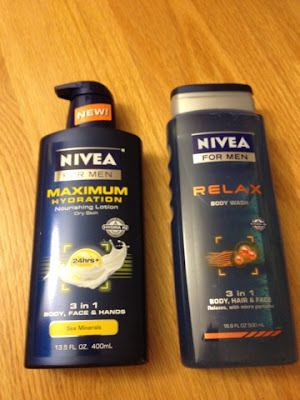 NIVEA for men: Maximum hydration nourishing lotion- this contains sea minerals and from what I hear really moisturizes well for your face and the rest of your body. It's an easy solution for your guy who isn't into using fancy product when a one-stop shop is all he needs. The only thing I've heard is that he wishes the moisturizing lasted longer. NIVEA for Men: RELAX Body Wash- This is also a 3-in-1 product in which you can wash your face, body and hair! This is a winner- because it smells incredibly nice and can be used for the entire body in the shower. It works well as a shampoo and body wash but for the face, and I quote "it naturally washes my face when I'm washing my hair" so no need to put additional product on the face if not needed. If only my skincare routine was that simple!